With the major cities and towns rapidly becoming concrete jungles that offer little or no refuge at all from the sun. City authorities are slowly waking up to the potential of trees in providing a calm and conducive atmosphere. As such there are increased efforts to line up the streets with fast growing, aesthetically appealing as well as easy to maintain trees - the palm trees. These trees provide a refuge for people seeking to enjoy the beautiful Floridian outdoors when the sun gets too hot for their comfort. 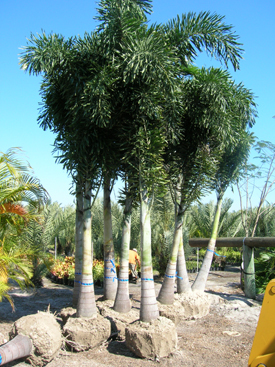 To complement the efforts of the city officials, aqualityplant.com, is the service provider of wholesale palm trees Saint Petersburg, Florida residents have come to depend on. We are headquartered in Ruskin Florida and boost of a huge collection of palm trees that have enabled countless number of property owners in Florida enjoy the various benefits of planting palm trees. Realtors across the state concur that all well-landscaped properties appreciate in value but also point out that areas that featured large shade providing trees such as palm trees were more valuable and were highly marketable. As your reliable development partners, aqualityplant.com supplies high quality and fast maturing palm tree varieties such as the Washingtonia (8-14’ trunk length at $75), Sabal Palmetto (8-20’ clear trunk at $89), Queen Palm (8-12’ grey wood at $225) as well as professional advice to help you grow your property value. At the home front, we offer a variety of container palms to help you create that curb appeal the will welcome you and your visitor to the glorious palm ringed paradise where you reside. In addition to creating a cool, colorful atmosphere, palm trees enable you develop well-designed home gardens containing a great variety of plants creating a rich, diversely and vibrant environment in and outside the house. A great many palms types, available from the wholesale palm trees Saint Petersburg, Florida bestsellers, can be used to adorn and decorate patios, terraces as well as line the driveways. Residential areas that feature tree line streets are considered and have been found to be safer, trendier and enjoy relatively cleaner air compared to the tree bare neighborhoods. It may seem q surprising, but it has been established that blocks lined with trees have a lower level of violence compared to communities that do not have trees. At aqualityplant.com, most of our palm tree are over five feet tall and mature fast; helping you create that cool and calm atmosphere around your property as well as your neighborhood relatively fast and conveniently. We are the choice wholesale palm trees Saint Petersburg, Florida and beyond. In addition to being relatively easy maintenance, palm trees reduce air pollution, provide more oxygen, and shield children from the harmful ultra-violet rays of the sun. Palm trees stocked by us at A Quality Plant ( your choice for wholesale palm trees in Saint Petersburg, Florida) are sure to transform your property into a wonderful paradise that you and your family can enjoy for years to come.